Under the shade of her tiny wood and corrugated metal hut in central Thailand, Ms Sala Phetnoy, 77, shuffles across the floor warily on her haunches. Community volunteers drop in once in a while to coax the stroke patient to practise walking while holding onto the grab rails they installed outside her door, but there is a limit to how much they can help home-bound folks like her, under a healthcare system that focuses on patients who can visit hospitals and clinics. Change could come soon, through a new long-term plan to care for the home-bound or bedridden elderly. The National Health Security Office (NHSO), which administers the country's universal healthcare scheme, has allocated an initial sum of 500 million baht (S$19.4 million) this fiscal year to fund home-based therapy and related care for 100,000 such patients. 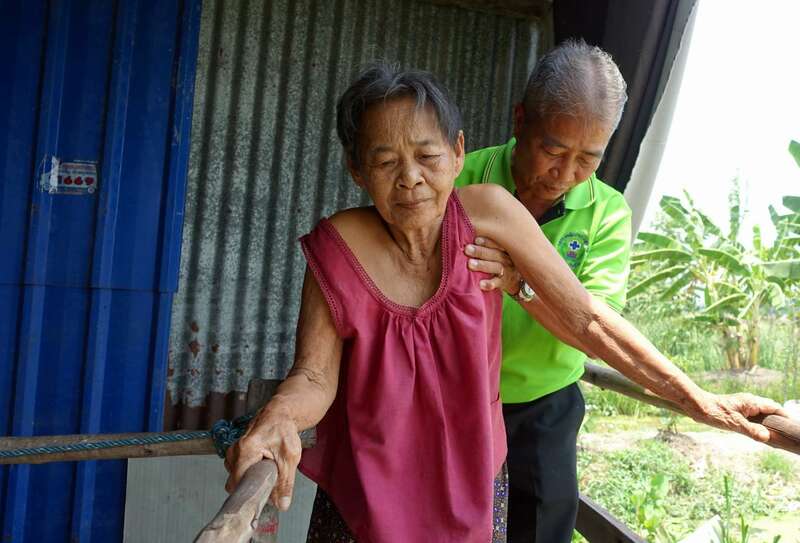 Working with local administrative organisations and community healthcare volunteers, the NHSO plans to eventually expand the programme to cover all the estimated one million vulnerable elderly citizens in need of such help. This is one of the Thai government's latest plans to cater to the greying population. By designing a system of localised care, the government hopes to control the future surge in healthcare expenditure. "When (the elderly) go to the hospital, it will cost more," Ms Orajit Bumrungskulswat, an NHSO senior director, tells The Straits Times. "A better way is for them to stay at home or in the community." Still, experts say a lot remains to be done in one of Asia's fastest ageing economies. Data from the United Nations shows that the proportion of Thais aged 60 years and above is expected to jump from 15.8 per cent last year to 37.1 per cent in 2050. Projections by the National Economic and Social Development Board (NESDB), the state planning agency, show that the labour force - which had 39.16 million people last December - will shrink by an average of 0.4 per cent annually from next year to 2021. That in turn could shave 0.15 percentage point off the country's economic growth potential every year. Meanwhile, rising costs are making manufacturers eye cheaper destinations next door even when local workers are not sufficiently skilled to move on to higher-value industries. This is creating conditions for what economists call a "middle-income trap". The International Monetary Fund, in a country report released in May last year, warned: "The challenge Thailand is facing is unusually severe. "The pace of demographic transition is similar to that in Korea and Singapore, but those countries are experiencing it at much higher levels of income. Among emerging economies in the region, only China's transition is almost as rapid, but China is developing considerably faster than Thailand." It surmised: "Under every conceivable scenario, Thailand will grow old before growing rich." Unlike Singapore, which raised its reemployment age, encouraged immigration, redesigned jobs and upgraded workers' skills to try and head off the worst of a greying-induced slowdown, Thailand had been too embroiled in political turmoil to address the looming demographic change early. The most recent upheaval took place in 2014, which ushered in a military coup and the current junta rule buttressed by a military-dominated legislature. Policymakers admit they are now playing catch-up. "This is just the start of the process," says the NESDB's secretary- general, Dr Porametee Vimolsri. The government, for example, is considering raising the retirement age of its employees from 60 to 65, while encouraging the private sector to hire older workers. According to a Reuters report, the state's pension bill is expected to rise from 61.37 billion baht last year to 71.23 billion baht in 2020. But academics say the system is riddled with inconsistencies and they have been calling for an overhaul for years. Although all elderly citizens not covered by pension plans get a government stipend, many feel the sum is too small. One of these recipients, Ms Aubon Suksa, 80, sells packets of tissue to passers-by from a canvas sheet under a pedestrian bridge in Bangkok's Siam Square shopping district. The elderly woman grimaces when asked if the 800 baht she gets a month is enough to live on. "I use it only when I go to the hospital," she mutters. "Or I put it aside for my cremation." Like Ms Aubon, some two-thirds of Thailand's working population make a living in the informal sector. They include farmers, motorcycle taxi drivers and casual labourers, who usually have little by way of savings unlike civil servants and private-sector employees, who are covered by pension plans or retirement savings schemes. The government is trying to nudge this group to save more. Last August, it revived a long-frozen voluntary scheme called the National Savings Fund, where members' contributions are topped up by the state in varying proportions. Some 400,000 people signed up in the first six months - an encouraging sign that nevertheless indicates how daunting it is to provide financial security for the more than 20 million still outside the system. A more immediate task is to review the tax system to generate income for elderly support, says Dr Jirawat Panpiemras, a research fellow at the Thailand Development Research Institute. This would also entail tackling larger, structural issues. A greyer society needs to become more productive to stay ahead, but several conditions work against Thailand. Agriculture, for example, employs about 40 per cent of the country's workforce, higher than less developed economies like Indonesia and the Philippines. Traditionally, the sector acts as a shock absorber in rough economic times, taking in those who cannot find work elsewhere. But that pool of underemployed labour, combined with previous administrations' generous farm support, has made Thailand's farm productivity lower than that of some of its less developed counterparts. Meanwhile, the country is producing too many unqualified graduates, many of whom also crowd the social sciences courses to the detriment of science, engineering or other more technical fields that could power future growth. While Thailand has a low unemployment rate - 0.7 per cent in December - about half of those unemployed have a degree, says Dr Porametee. At the launch of a research incubator programme by seafood giant Thai Union Group last month, one of its executives complained that he found it difficult to find scientists to take part. Then, there is the business of creating an elder-friendly physical environment. Ms Siriwan Aruntippaitune, an expert in the newly created Department of Older Persons, observes that the concept of universal design - which makes spaces accessible to people of all age groups and physical conditions - is still new to Thailand. Her department has worked with some local administrations to introduce elder-friendly facilities, but sometimes ends up with unsatisfactory results like ramps that are too steep to be used. Yet there are also good models around. The municipality of Bueng Yitho, which services 33,000 residents in the central province of Pathum Thani, runs a small-scale community health centre and physiotherapy clinic that save patients the more expensive visit to larger hospitals farther away. For elderly patients with mobility problems, the doctor keeps up to date on their condition through regular reports by community healthcare volunteers who make home visits. Treatment is free for those registered under the universal healthcare scheme. 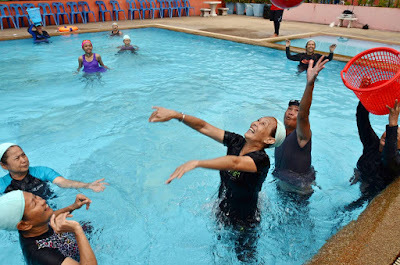 Meanwhile, the municipality has three senior activity centres within the 15.4 sq km under its jurisdiction. 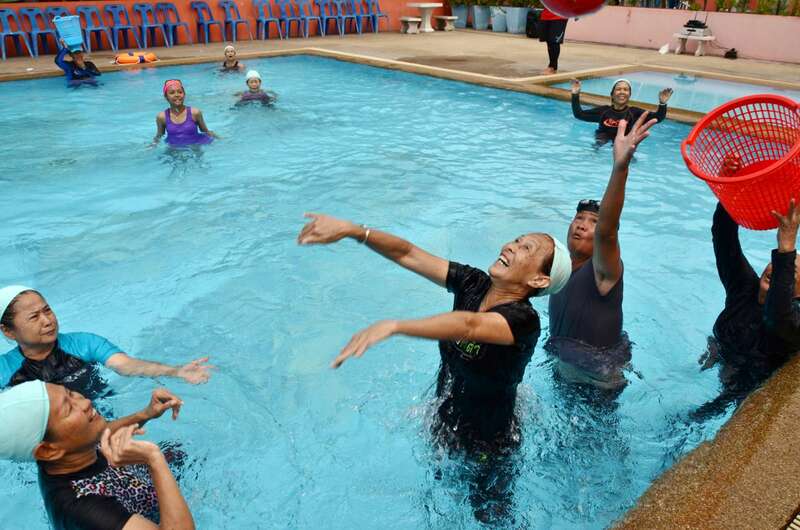 Membership is capped at 300 baht a year for the elderly, including use of its swimming pool. When The Straits Times visited one of the centres earlier this month, it found it staffed by enthusiastic elderly volunteers like Mr Lak Uttikritachai. The 68-year-old man used to have to struggle with debt trying to support his family while selling snacks on the streets. Today, his two daughters are grown up and supplement his 600-baht monthly government stipend with a 4,000-baht allowance. Mr Lak, who learnt Mandarin when he was young, gives free Mandarin classes to his compatriots at the centre. "My life is pretty good now," he says. "So I try to help others."